Man is in love with what abandons him. That’s the starting point of every quest. Hello, thank you and welcome to The Red Diamond. We hope it stirs your imaginations and that you enjoy it in every way. 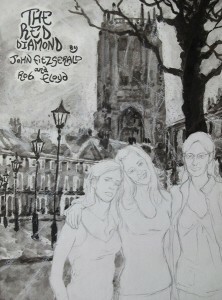 The Red Diamond is essentially an Art Book, with Rob’s illustrations playing as central a role in the story’s unfolding as does my text. Our intent has not been so much to say, ‘this happened here, that happened there and here’s the picture to prove it’, but rather to allow words and pictures to come together in the hope of creating new contemplative spaces – evocative spaces – spaces of growth, possibility and playful creative change. The text tends therefore to concentrate more on atmosphere and mood than the adoption of a purely realistic approach to the story’s development. In this sense, one could say that The Red Diamond is more akin to a series of inter-connected, impressionistic prose poems than a conventional novelistic-style narrative. The emphasis rests throughout on contemplation, meditation and reflection; with words, pictures and even line-spacing and page layout working in concert as aides-memoires to that end. The Red Diamond concerns itself with central existential issues, germane to all our lives – questions of meaning, purpose, depth and transcendence. It could never, however, aspire to offer a comprehensive or systematic overview of the philosophical and spiritual crises affecting our society today. It is, we hope, more a freewheeling exploration than a definitive attempt at resolution – an exploration into how and where people find value and resonance, both in the individual and in the collective spheres. What if, however? What if it’s exactly, and maybe only this absence of answers that brings authenticity and substance to our existence? To think along these lines, to accept complexity as an essential and welcome ingredient to our lives, would suggest a highly nuanced view of the human predicament, markedly different, for example, to the ready-made solutions offered by the world’s various varieties of fundamentalism – political, scientific, religious, ‘New Age’, etc. And here, Rob and I have an opportunity, after having said so much about what The Red Diamond is not, to offer an indication of what it actually aspires to be – a meditation in words and pictures critiquing the mono-dimensional worldview of any and all fundamentalisms. The Red Diamond is a paean of praise to the mysterious, the oblique and the uncertain. So often, a natural wariness of life’s inherent ambiguity and impermanence seems to usher us, almost imperceptibly, towards the simple rigidities of the fundamentalist trapdoor. But it is only, Rob and I feel, when we fully open out to the mystery of our lives, acknowledging how little our minds can possibly know or grasp, that imagination, creativity and vision can begin to take on true definition. A fundamentalist, literalist reading of the world, from whichever angle, always closes the doors on other ways of seeing and understanding. The Red Diamond, if it insists on nothing else, insists on keeping the doors open. Our three central characters – Jacqueline, Julie and Claire – lose their jobs when the visionary (and fictional) Leeds-based arts centre, La Canebière, closes in mysterious circumstances. La Canebière offered them a platform, exceptionally rare in the contemporary workplace, where they were given freedom to express and develop themselves fully, both as human beings and also – through Jacqueline’s flair for words, Julie’s dramatic intensity and Claire’s painterly eye – as artists and as thinkers. How then, might one come to terms with the loss of such a beneficent milieu? What myths might one create to make sense of this ‘Fall’? What forms might the subsequent search for individual and collective significance take? The Red Diamond is a book about transcendence; this innate and insistent need human beings seem to have to connect with a bigger, wider reality – greater than themselves but also existing outside themselves. Not so many years ago, perhaps, people might have been able to quench this thirst through the strictures of organised religion, in the arms of the ‘nuclear family’ or via a ‘job for life’. But all of these, and many more formerly ‘rock solid’ beliefs and institutions, float together today in a sea of volatile flux. The old certainties have gone. Our lives have become fluid, flexible, insecure and unpredictable. And this malleability, this sense of ‘permanent impermanence’, leads us sometimes to feel like we live our lives awkwardly suspended between two eras. The old ‘gods’ have lost their psychological hold while new approaches to meaning have yet, generally speaking, to make their presence clearly and tangibly felt. We inhabit, it often seems, a deregulated, value-free, post-modern void. And she mourned, on those sacred stones, her lost moment of clarity, blasted and broken forever. She gazed longingly at the door and the weight of glory it represented, offering a silent, heartfelt prayer for healing – an end to the civil war inside her and a restoration of values to this awkward kingdom she was, like it or not, standing at the very heart of. The far from still point . The centre of the torn and troubling world. The Diamond began to rotate with a voluptuous golden beauty, as if the sun itself was rising through its texture, red transforming to an all-conquering, invincible, irrepressible gold. The light dazzled as Jacqueline shielded her eyes, gold absorbing the pillars and the stars until the whole fantastic panorama consisted of nothing but this staggering light. But just as Claire’s tears dry up and segue into an opposite ‘happy’ phase, so too Jacqueline’s epiphany in the ruined theatre dissolves and gives way in its turn to forgetfulness and puzzlement. Nothing is stable in The Red Diamond. Nothing is solid. Nothing can be wholly trusted or relied upon. Ultimately perhaps, it could well be that we (contemporary men and women) might just have to bite the metaphysical bullet and dig a little deeper inside, coming hopefully at length (and with a bit of luck!) to a new and richer place, a place at one remove from the quest for transcendence and also the sense of meaninglessness that engenders it. This then, maybe, can become our long-term mission, our task, our ‘edge’. To pass, if possible, beyond duality, beyond the illusions tying us to the wheel, illusions keeping us in random oscillation from hope on one side to despair on the other. The possibility and likelihood of such a refuge, more immanent perhaps than transcendent, will be explored more fully in the follow-up to The Red Diamond we are currently engaging with. For now however, we leave you at the starting point – our heroines poised to embark on their quest, already embarked on their quest in fact. Because positive, creative change remains impossible without this starting point, this despair, this meaninglessness, this necessity to do more and be more than our small selves, our restrictive personalities and limited horizons so often seem to allow. A point arrives sometimes where we feel we have no option but to tear our past lives up, setting our course anew for something bigger, deeper, wilder and wider – for meaning and for purpose – for what reality might be like at a much more central region. Here we must needs embark again. But let your poison be your cure. Our end is Life. Put out to sea.